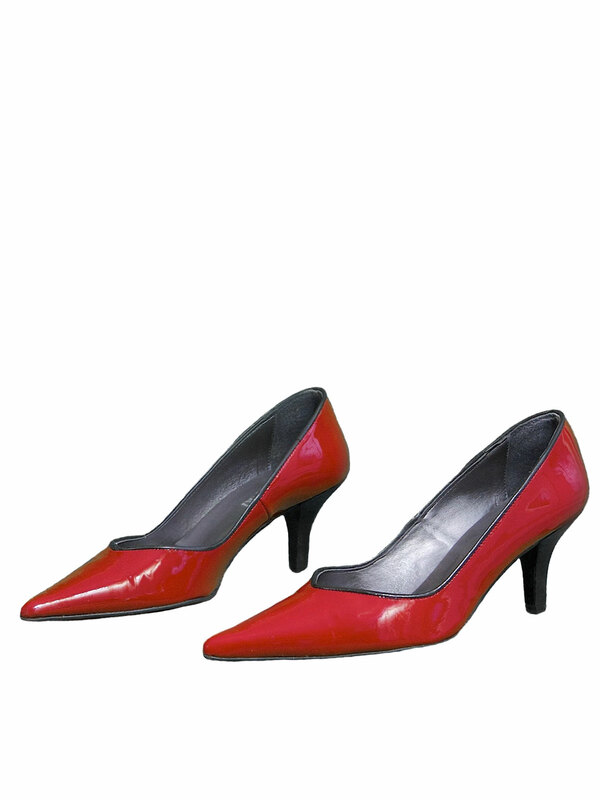 Very stylish and eye-catching low heel shoes in genuine red patent leather with black leather edging. They have a pointed toe and the low heel is in black. By Gucinari, makers of fine footwear. 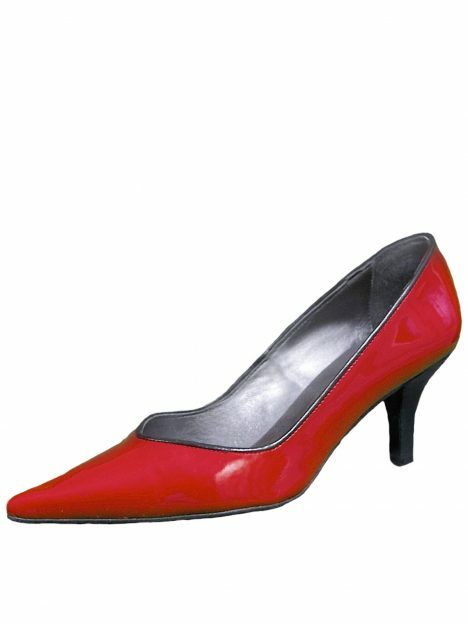 These are beautiful women’s low heel court shoes in genuine red patent leather with a fine black leather edging. The red is a lovely bright but deep rich red. They have a pointed toe and the low heel is in black. By Gucarini. These platform high heel sandals by Pleaser USA are amazingly high and quite crazy - not for the faint-hearted! They are very well-constructed with a 6.5in stiletto heel in chrome with diamond-cut detail, while the high platform sole features a clear central inset. The high heels have a single ankle-strap fastening. A suede sock adds comfort and grip to the foot. In black or white shiny patent material. Please see our Product Description below for full details and important sizing information. Sassy-looking black patent high heel sandals with 7-straps with buckle fastening, reaching above the ankle. Three narrow straps are on the foot, another 3 from the ankle upwards and 1 wide strap at the top. 5in stiletto heel and mini-platform sole. Well-constructed and comfortable footwear from Pleaser USA. Note: The images show sandal with plastic insert to hold it in shape for the photograph. Please see our Product Description below for full details and important sizing information. Attractive stiletto high heels in an off-white soft faux suede with a contrasting heel and platform in soft raspberry red patent. Just perfect for your outfit any season. By Rascal. Please see our Product Description below for full details. Another classic from Pleaser USA - black patent platform high heels with rounded closed toe (high heel pumps). These are sturdy and well-constructed shoes, not light and flimsy. They have a 6in stiletto high heel and high platform sole.